Let's welcome Derrick to the Big Apple! Join the Greater New York Chapter as we welcome Derrick Henry to New York City for the 2015 Heisman Trophy Presentation on Saturday, December 12 at the PlayStation Theater at 1515 Broadway, between 7th and 8th Avenues. UANYC will gather just outside of the PlayStation Theater at 7th Avenue near 44th Street at 6:30 p.m. Please dress in your Crimson Tide finest and bring shakers, foam fingers, even posters if you're feeling crafty! We want to show our Alabama Pride as we welcome Derrick to the Big Apple for the ceremony. Alabama fans will be staged in a location where we will be able to see the finalists walk to the theater prior to the presentation. Derrick will have a couple minutes to interact with our group and pose for pictures just before he goes in front of the cameras to see if he will win the 81st Annual Heisman Memorial Trophy. 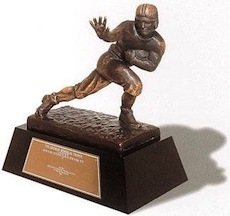 After we see Derrick, the group will head down to The Ainsworth Chelsea to watch the Heisman Ceremony live at 8:00 p.m. Roll Tide!